A much welcome upgrade to the very successful X-Cube EVO WP boots, the TCX Rush WP Boots are a sporty looking sneaker with excellent protection and style. From a technology standpoint, these boots are a significant upgrade over the X-Cube. A new carbon fibre heel as well as a polyurethane toe sliders, make this boot much more aggressive than it's predecessor. Great for those riders who really want to push it on their morning commute. The boots also feature air intakes in the ankle area which greatly improves the boots breathability through its waterproof lining. The Rush WP also has tons of reinforcement throughout the boot for excellent protection as well as a high wear-resistant sole. 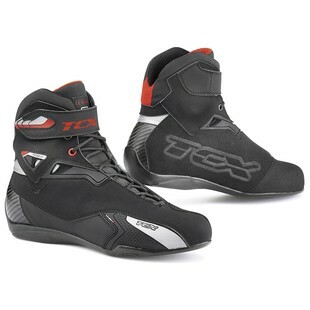 Overall, the new TCX Rush WP boots are a great option for those who want sneaker styling with the protection of a boot. They maintain a great sporty look and will go great with both casual styling or full on motorcycle gear. I expect to see a lot of sport bike riders wearing these this coming fall.